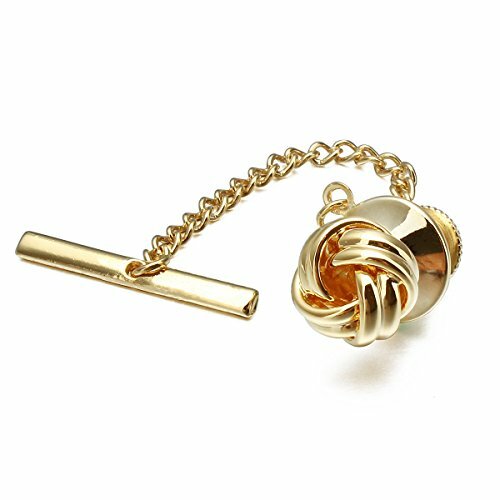 HAWSON Sailor Knot Tie Tack for Men Metal Tie Pin Gold | What Should I Say? HAWSON Jewelry: Your Best Choice for Men's Fashion Accessories. Tie Tack With Chain,Keep Your Tie In Place. Size:10mm, Weight:4g Black Gift Box. Simple Design Tie Pin For Men,Won't Over The Color of Your Necktie. It's Suitable for Any Ocassion, Wedding, Business,Party. We Provide 90-Day Money Back Guarantee or Exchange If You Are Not Satisfied with Our Product. As the Usage of Tie Clips,A Tie Tack Can Keep Your Tie In Place. Size: Crystal:10 mm, Chain:52 mm. Weight:4 g,Package : A Black Gift Box.